A cat made famous on social media for being a sour puss has won £500,000 (AU$880,000) in a copyright legal battle. During the trial at California federal court, it emerged that Grumpy Cat Limited was suing the owners of US coffee company Grenade after they broke the terms of an agreement over the use of the moody cat’s image. The companies had come to an agreement that Grumpy Cat’s image could be used to sell Grenade’s “Grumppucinos”. But Grenade broke the agreement when it sold other “grumpy” products. Grumpy cat, real name Tardar Sauce, rose to fame when her photo was posted on Reddit by her owner. The image of grumpy cat quickly took off and began to appear in memes all over the Internet. Grenade Beverage struck a deal with Grumpy Cat Limited in 2013 to use the cat’s face to market iced coffee beverages in exchange for £105,523 ($150,000). Grumpy Cat limited sued the company in 2015 for breaching the contract after it sold Grumppicino t-shirts and roasted coffee. It claimed that Grenade had "blatantly infringed" their copyright and trademarks. But the coffee chain’s owners said that Grumpy Cat’s owners had not held up their end of the bargain to promote the drinks on social media and countersued. Grenade also alleged that Grumpy Cat’s owners said that the cat was due to appear in a film alongside actors Jack Black and Will Ferrell, but the film never immersed. 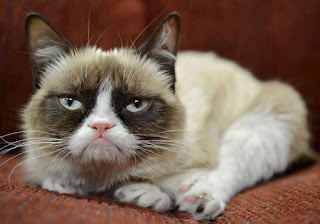 The jury sided with the Grumpy cat and her owners and ordered that the coffee company pay £500,000 ($750,000) in damages alongside a $1 nominal damage fee for breach of contract. Courthouse News reported that Grumpy Cat made an appearance during the trial but was not present for the verdict.